In 2012 we got our F2, Loki, from A1Savannahs. He has always been very active, healthy, and full of personality. Sometimes he’ll want to cuddle, or play and other times he’s perfectly happy on his own. He can get into mischief, but with his high level of intelligence he is very trainable. We have moved twice and he has adapted well with minimal stress both times. Loki lived with a yellow lab for his first 4 years. They got along well and played all the time. We have a fenced in yard that we allow him to roam under supervision, or on a harness and lead. He is a very proficient hunter of mice, squirrels, and chipmunks. 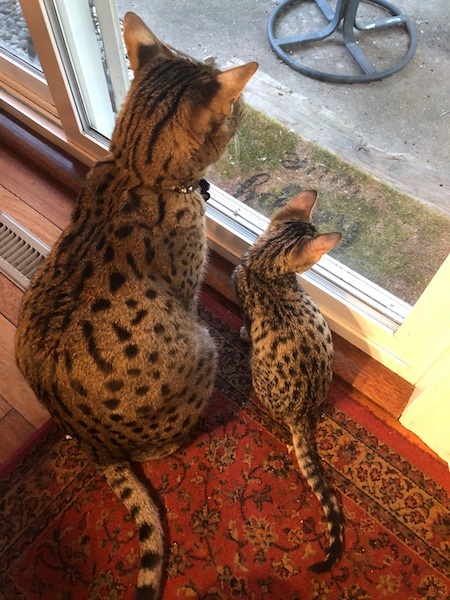 This spring (2018) we decided it was time to get Loki a little brother, so we turned to A1Savannahs to pick their minds. Martin and Amanda were extremely helpful in answering all the questions we had. Their knowledge of this breed of cat and how they might fit into your lifestyle is unmatched. They are both extremely personable, easy to chat with, and make you feel comfortable in your decision. A1Savannahs does not stop short when answering your questions and is not afraid to tell you the possible negatives of the cats as well. We felt assured, once again, that they are not out to just peddle cats. They truly care about the cats they breed and want to make sure they go to a good home where they will fit in and work with your lifestyle. On several occasions I had spur of the moment questions and A1Savannahs was almost always free for a call, or would get back ASAP. They send you all they information you need to be ready when your new kitten arrives. When there was an available litter of SBT kittens, we waited eagerly for them to be posted. Right away when we saw Coby (who we later named Lex), we knew he was the boy for us. We submitted our application within 3 minutes of him being posted and got a text and email response almost immediately from Martin and Amanda congratulating us on our new kitten. We worked with them to prepare for his arrival and they helped that process go very smoothly as well. When I picked up Lex at the airport, he we meowing at me constantly. Once we got to the car I set the crate down and opened it up to see if he wanted to come out. Within seconds he walked out and straight into my lap to nuzzle his head against me and to get pet. A1Savannahs does such a fantastic job socializing their kittens that he had no fear to be around me! From literally out-the-gate he has been a little lover. I let him explore the car while I drove home since he wanted nothing to do with going back in the crate. He leapt, played and explored the whole way home. Once we decided to introduce the cats to each other, Loki was a bit hesitant. He had not had another animal in his territory in a year and a half, so he wasn’t sure how to take it. Lex had zero fear of Loki, though. All Lex wanted to do was play and Loki wanted no part of it. You wouldn’t believe how funny it was to watch a nearly 20 pound muscular cat get chased around by a 3 pound kitten! 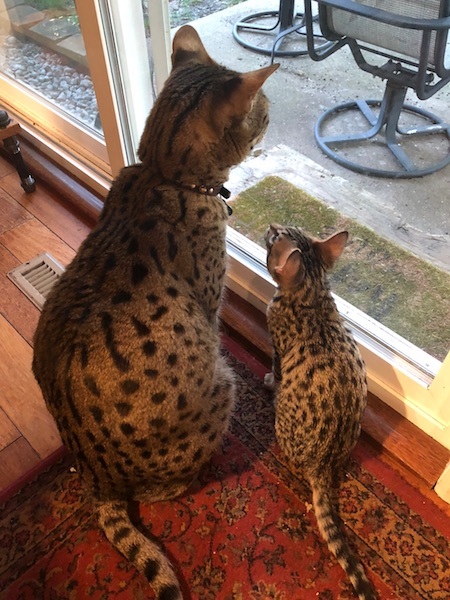 Needless to say, after a few days of slowly introducing them with increasing intervals, Loki finally warmed up to his little brother. Loki is still a cat on his own terms, so he likes his space on occasion, but they are best buddies. Throughout the day its very common to find them chasing each other around the house, wrestling, and (when they think no one is watching) grooming each other. Sometimes they’ll play for over an hour before they tire of each other. No two cats are the same, so you never know what you’ll get. However, Savannahs definitely have a lot more personality and intelligence than your average house cat. I think of them more like a low maintenance dog, than a cat. Its also worth keeping in mind that they do still have wild genetics in them. We have two wonderful boys, both from A1Savannahs. While I write this, Lex has been laying on my shoulders purring away and Loki has been laying by my side. These are truly terrific animals. I couldn’t think of a better experience than working with Martin and Amanda if you’re considering bringing one into your life. I highly recommend them whenever I get the chance and love showing A1Savannahs’ social media accounts to friends and family. They post great and helpful content, have wonderful products available, and in my opinion produce the best cats you could ask for. A big thank you to Martin, Amanda, and everyone’s hard work at A1Savannahs! We look forward to continuing this relationship and look forward to more kitties in the future!